The commercial drone market is in growth and investment from venture capitalists is on the rise, the hobby drone market is currently in decline because of the number of cheap imports but, interesting the drone racing segment of the hobby market is still growing and it is growing fast! Drone racing was bound to take off, we have said before that a child of the 80s might dream of a remote control car under their Christmas tree but a child of 2017, 37 years on would probably be disappointed unwrapping something on wheels that is earthbound and it is more likely they would have their hearts set on a drone. When two kids have something that can move around at speed it is inevitable that they will end up racing but as we are seeing, drone racing is not something just limited to kids! While drone racing is in its infancy but as with anything up and coming the people who get in early often have the most to gain, the DRL or Drone Racing League is the most successful and recognised upstart racing body organisation and, in an attempt to draw in more casual viewers in addition to die hard drone heads mixes storylines, storytelling, technology and competition into weekly content in a fashion not dissimilar to the WWE. The pilots will be made into stars and presented in different lights so that everyone has their favourite and cameras will follow them around their homes before and after big races. Who knows it may come to the point where pilots cut scripted promos wrestling style, we may even see scripted stories and line writers. While the DRL is the most well backed drone racing outfit to date there is already a grass routes drone racing movement with many races taking place regionally every month. Before the DRL there was an alternative outfit which still races called The Drone National which focused much more on racing than the glitz, glamor and celebrity approach taken by the DRL. Last summer in Sacramento there the first ever National Drone Racing Championship took place in which over 100 people completed. Due to lack of publicity not many people were aware of the World Drone Prix which took placein Dubai in March with a life changing prize of $250k US won by a 15 year boy from the UK. The first season is going to be made up of 10 episodes with the first hour long episode been an attempt to educate non-droners with some information and details about the rules, how things will work and drones in general. Drone racing is not as simple as it sounds, it is not (usually) a case of 2 drones setting off from point A and trying to reach point B rather there methods of collecting points along the way, success in the Drone Racing League requires a lot more than a fast drone that can fly in a straight line and around corners. Pilots do fly their drones using line of site but in order to succeed the drone pilot needs to be much more skilful than the average flier who plays around in the garden. To succeed in the DRL pilots need to be skilful flying beyond line of site (BVLOS). This adds some further excitement for the viewers as the drone mounted camera is one that viewers can take advantage of jumping inside of the cockpit to see the action. In the future there might be more of a freestyle racing option but at the moment the plan is for pilots to use identical drones to race with, these drones will be light weight stripped down quadcoptors but a grade above consumer drones, the absolute bear minimum providing the pilots with as little assistance as possible with the exception of additional LED lights which will help with the visibility and focus of cameras for the viewing public. Drone races are pre recorded to allow time for editing, while there is always an element of excitement added to a live event and perhaps there will be live drone racing in the future the multiple camera angles mean that the cutting and editing can really add a huge level of excitement that would not be present on a live broadcast. A live broadcast cant cut to the internal cam just before a crash or suddenly show you two angles at the same time as an engine failure occurs but with a bit of editing and a nice baseline playing over the flight we can suddenly make something that seems like a bit of fun genuinely exciting. It has been documented that one of the reasons for NASCAR popularity is the crashes that take place and the DRL has more than its fair share of crashes. As drones are unmanned there is no human risk involved so even the friends and family of the pilots can enjoy the crashes. The crash element is added to by the on board cameras and close ups which often film not only the impact of the crash but the drone going to the ground after woods. Interactive viewing allows views to jump in and out of the cockpits or watch from a line of site perspective at will. There is some truly stunning camera work as the best pilots in the world navigate the courses at over 120 miles per hour. 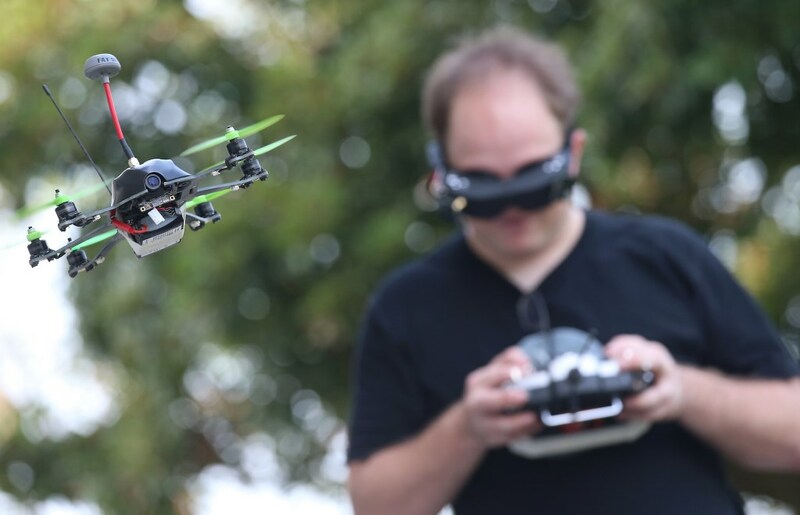 Drone racing is not without its cynics, however, when you look at some of the sports and the size of their loyal base it really neutralises the counter argument, there is huge global interest in Poker, Chess and Scrabble. More recently e-sports have become something people are willing to spend time watching (you could argue that this started back in the early 90s when the viditors took to our screens on Games World). The recent success seen by ESPN of BattleFrog and Crossfit also show that there is scope for any kind of programming which is well marketed and obtainable. By obtainable we mean within the reach of any of the general public could go out and do it. While you could imagine yourself taking part in Battlefrog, CrossFit or drone racing things like the Olympic 100 meters is strictly a spectator sport and the feel that people could get involved in something is increasingly appealing. Stephen Ross and Dan Gilbert, owners of the Miami Dolphins and Cleveland Cavaliers respectively are throwing their collective weight behind drone racing along with a $12US million investment from the venture capital company RSE Ventures. Another potential reason why drone racing will grow in popularity is the growth of the casual gambler, it could be argued that the popularity of e-sports took off when live betting was offered on some sites causing a peek in interest in a demographic which was previously totally uninterested in computer games.